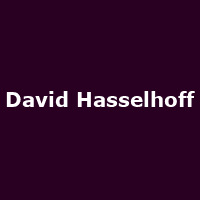 David Hasselhoff's career has been a masterclass in professional persistence. Soon to turn 60, and looking pretty good on it, it must be said, The Hoff has enjoyed a range of successful careers as a pop artist (two No 1 singles in Germany), a star of musicals (Chicago, The Producers) and, of course, as part of some of the most popular television shows ever made. He has popped up on telly more recently; as a judge on Britain's Got Talent and on the American version of Strictly Come Dancing, Dancing with the Stars, but it is for Knight Rider and Baywatch that he remains best known. If Knight Rider was The Hoff's big break, Baywatch was the show which made him and which cast the die for a man who does not know the meaning of going quietly. When Baywatch was canned after just one season, sensing its potential, Hasselhoff (and others) revived the show. He became one of the most successful TV actors of his generation and brought the seductive curves of the famous red swimsuits worn by Yasmine and co into living rooms around the world. If you've ever wondered when it was exactly that dad began taking his Saturday evening meal through to the lounge, it was in the early nineties when Pamela Anderson's onesie started joining him for dinner. David Hasselhoff will be chatting, singing and generally messing about at London's Leicester Square Theatre on Friday 17th and Saturday 18th August 2012. We have tickets available now, priced £25. You can also catch The Hoff in panto next Christmas - he'll be starring in Peter Pan (as Captain Hook) at the Manchester Opera House from 8th December until 13th January 2013 - we have tickets on sale now, priced from just a tenner.